Did you ever have one of those moments where you’re doing something and it hits you? An idea that stops you in your tracks and sends you creating? Last evening, while with my family, I threw my hands up in the air and ran to get all supplies needed to create a milk carton made out of an Acetate Sheet. Kinda difficult to see in the pic, but it’s a mini milk carton. You can see Beate’s full tutorial on how to make one of these here. How cute!!! 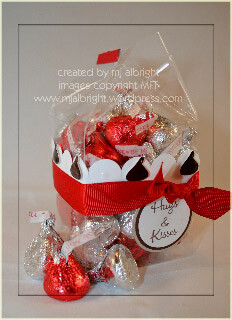 Now you can see all the yummy kisses inside which is just perfect for a Valentine exchange. I had to keep the details on the outside simple due to being able to see the chocolate & the aluminum wrappings (well, as simple as I can…I do go crazy). I used MFT stamp set How Sweet It Is. The kisses, well I stamped them on Whisper White CS, colored in with a Chocolate Chip Stampin’ Write Marker, and added Crystal Effects. I cut them out and attached to Whisper White CS with Stampin’ Dimensionals. The scalloping was created with a Slit Punch. On the scallops without kisses, I dry embossed a circle using a Crop-A-Dile Tool. Tied Real Red 5/8″ Grosgrain Ribbon in a knot. The sentiment was stamped in Chocolate Chip ink on Whisper White CS and punched out with a 1-1/4″ Circle Punch. Next layer is Chocolate Chip CS punched out with a 1-3/8″ Circle Punch. Layered these on an Aluminum Circle Tag and adhered to acetate with Sticky Strip. I added a small strip of Real Red CS to the very top of the carton just to cover up the Sticky Strip that was visible. MJ, you rock! I love it! Oh my word! This is gorgeous! LOVE it! Love your cool twist on the milk carton! Wonderful idea! awesome!!! I love it!! Where do I get acetate???? Very cool! I love that you can see what is inside!! Wow I will have to try one of these. My customers will love it! Thanks for sharing! That’s a great idea, I never thought abous using acetate for making boxes. This is so creative and adorable at the same time! TFS! This was a Great write up, I will be sure to save this in my Mixx account. Have a good day.